Today I'm delighted to welcome Edward Dron, author of the lovely pillow-time picture-book, Pillow Parade. He's offered to let us know why he wrote this sweet tale of sheep and a rabbit--and a child who can't get to sleep. As a parent, you always want to pass on the things you’ve learned about life to your children. A big part of our role, as parents, is to help our kids navigate this tricky world. One thing I’ve noticed is how important it is to not give up - to persevere. There are a number of independent studies that back this up. Researchers have found that the number one predictor of success is grit. Basically, it’s the ability to get up after you’ve been knocked down. You often hear stories of how successful authors, entrepreneurs, musicians, and actors faced an enormous amount of rejection, resistance, and frustration. They didn’t give up. They persevered. As Bill Bradley once said, “Ambition is the path to success. Persistence is the vehicle you arrive in.” It’s safe to say that at more than one point in every person's life they are going to face resistance. It might be because of their gender. It might be because of their religion or ethnicity. It might even be because of how they look. This is often a very key moment in people’s lives. They can choose to give up or they can choose to persevere. Olive, the main character in this book, has an unquestionable talent for jumping. 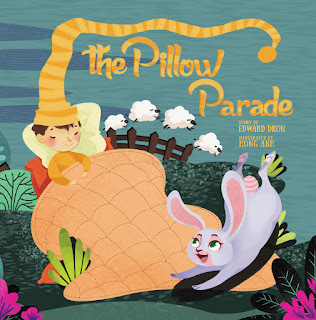 Based on her skills, you would think that the sheep would be thrilled to have her join their Pillow Parade. Yet, she meets up with resistance. Why? She was born a bunny. This is a very key part of the book. Olive had two options. Luckily, to paraphrase Woody Hayes, she decided to paralyze resistance with persistence. She chose not to give up. My hope is that this book will inspire kids to not give up during frustrating moments in their life. For children, these moments might be about something as simple as having trouble zipping up their coat. As a parent, I love these little moments. It’s a great opportunity to strengthen their character. I’ve actually said a few times to my kids, “Would Olive pout or cry?” They usually smile and say no. It acts as a nice reset. An opportunity to regroup and rethink the challenge. This question actually comes from one of my favorite parts of the book. It happens right after the grumpy sheep tells Olive that she’s not allowed to join his sheep-only club. Since this might not be the most fun topic to discuss, I tried not to be heavy-handed with the delivery. That’s partly why I tell the story using lyrically playful rhymes. I want kids to enjoy it and laugh. Although the key lesson is unquestionably there, it’s gentle in its delivery. 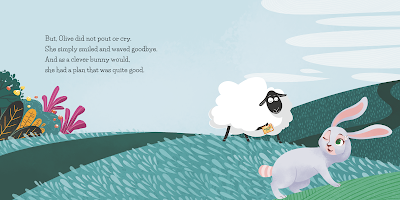 Having read and loved the book, I can vouch for the fact that the delivery is indeed gentle, and the rhyming is lyrically playful and smooth. It's a very cool way to deliver an important message, and I love that Bill Bradley quote - maybe I should print it out and tape it to my computer. My vehicle has a habit of breaking down... but would Olive pout or cry? Thank you for joining us Edward, and I hope lots of children sleep well after hearing this story, and wake up ready to work through the challenges placed in their way.